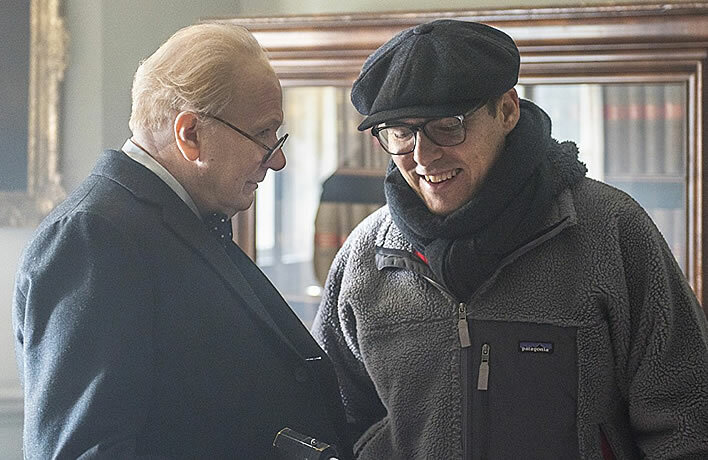 Gary Oldman as Churchill. Image: photograph by Jack English, ©2017Focus Features LLC. There's not much physical resemblance between Angela Merkel and Angelina Jolie – just about as little as there is between the British actor Gary Oldman and Great Britain's wartime premier Winston Churchill. On the one hand the fit, nearly sixty-year-old actor – on the other the solid, stocky and overweight statesman with a walking stick, whose head or silhouette on sculptures and memorials is recognisable from afar. 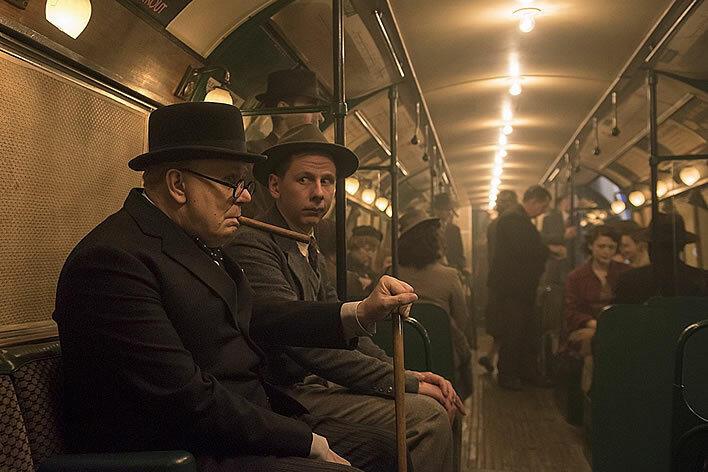 Left: Gary Oldman (Churchill). Right: Joe Wright, Director. Image: photograph by Jack English, ©2017 Focus Features LLC. The director of the film, Joe Wright (known among other things for his drama 'Atonement'), and the lead actor can count themselves lucky that they were able to acquire Kazuhiro Tsuji, an absolute master make-up artist, despite his retirement from the film business. 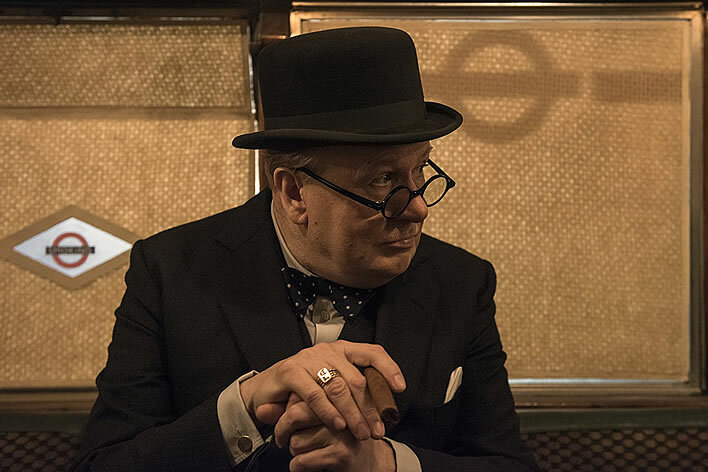 Churchill (Gary Oldman) in the Cabinet War Rooms. Image: photograph by Jack English, ©2017 Focus Features LLC. 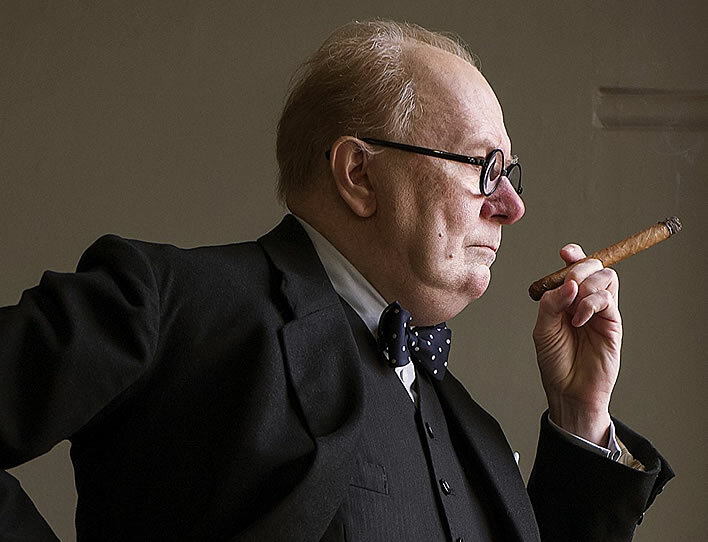 Gary Oldman (59) as Winston Churchill (then 65) –	a genuine wow-moment: one finds oneself transported to May 1940, the time of Britain's greatest danger since 1066, when the then First Lord of the Admiralty was made Prime Minister. The representation of historical figures in movies is a tricky matter. Neither a pretend documentary film nor a retreat into complete fantasy can attain the goal, as the fundamentally failed film Churchill from Jonathan Teplitsky (2017) showed us. In the present case the script by Anthony McCarten carries conviction, in that the solid historical reality is in its main points accurate. Not only the external conditions under which the cantankerous minister, under the distrustful eye of his own party, attained power (as a result of a crisis provoked by the Labour party), but also the character portrait of Churchill given in Darkest Hour satisfy even the profoundly knowledgeable luminaries of the International Churchill Society, not to speak of the grandchildren and great-grandchildren of the wartime prime minister who turned up in a sizeable delegation on the film set. 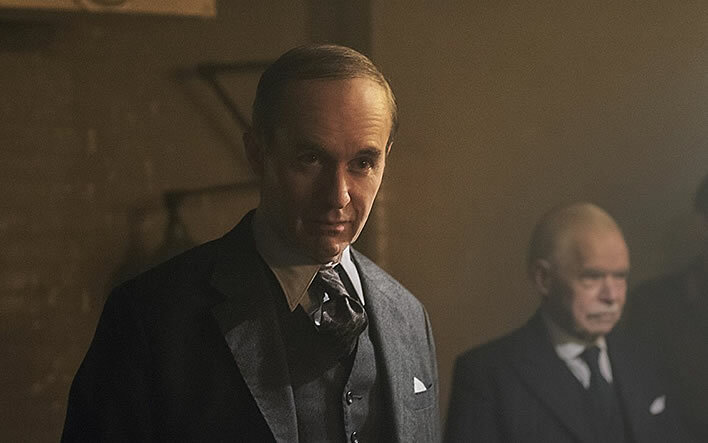 That said, the scriptwriter and director allow themselves some liberties with history in the interests of a gripping plot, for example in the representation of the conflict between Churchill's moribund predecessor, Neville Chamberlain (Ronald Pickup), and his subordinate, Lord Halifax (Stephen Dillane), characterised as Cerberus. These two, especially Halifax, mockingly called the 'Holy Fox' by the Prime Minister, in real life had nowhere near the bite they are given in the film. By the way, as soon as Churchill had consolidated his power he disposed of Halifax by dispatching him to be Ambassador to the USA. 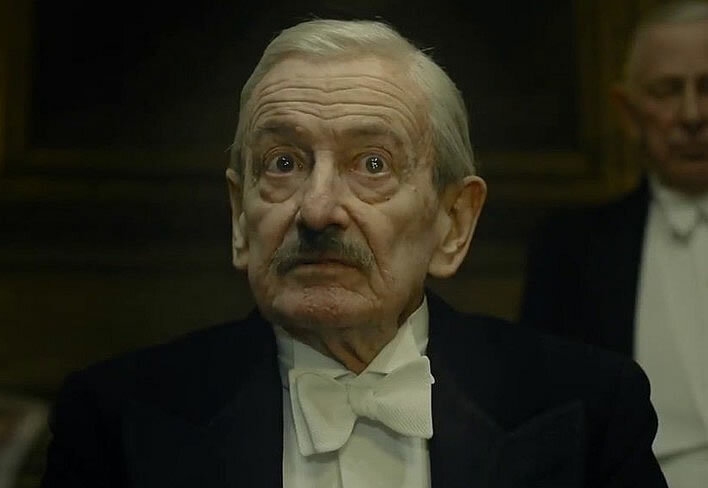 Top: Neville Chamberlain (Ronald Pickup). Bottom: Lord Halifax (Stephen Dillane). Image: photograph by Jack English, ©2017 Focus Features LLC. A true outburst of British humour comes in the scene in which Churchill is travelling alone (!) on the London Underground and carries out a spontaneous vox pop survey on whether the British should negotiate with Hitler's Germany. That is historical humbug, served up with English brazenness. 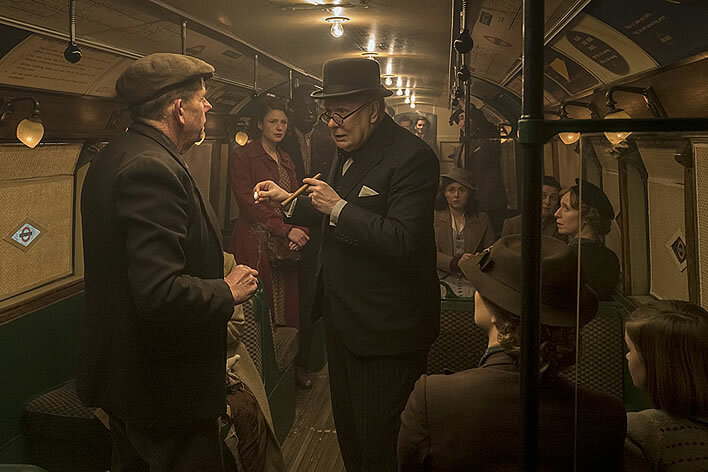 Churchill (Gary Oldman) travelling on the London Underground, conducting an impromptu opinion survey of the great British public. Images: photograph by Jack English, ©2017 Focus Features LLC. The director has also played tricks with one of the dramatic locations: the underground, bombproof Cabinet War Rooms (now a museum). Churchill went there only during the worst period of the Battle of Britain and only then when absolutely necessary. The reason: there was no bathtub for his ritual bath after his lunchtime nap. But which director could ignore this unique setting? In a wooden arm of Winston's chair can be seen to this day the grooves that he scratched in it with his signet ring in moments of anger. In front of his seat the giant humidor. This ambience – dramatic rapid framing of character faces, fast camera flights through the underground tunnels and the brass and drums of Dario Montanelli's film score – this is pure action cinema without the use of pyrotechnic tools. 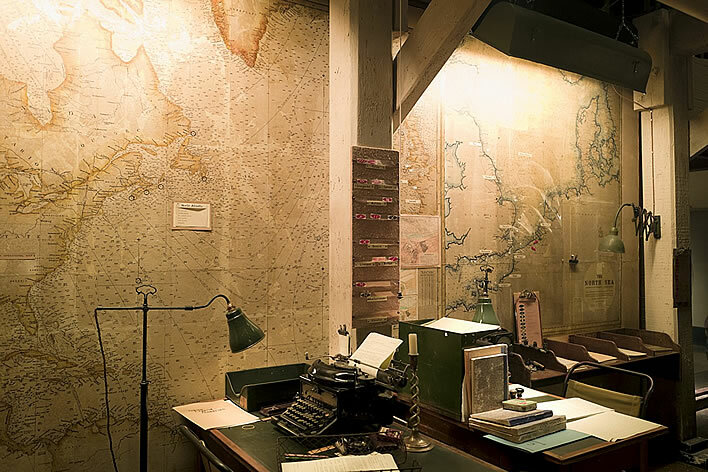 The Cabinet War Rooms. Image: photograph by Jack English, ©2017 Focus Features LLC. Despite the occasionally relaxed treatment of the reality of the three dramatic weeks between Churchill's appointment and his famous 'We shall fight on the beaches' speech with its momentous 'We shall never surrender! ', Gary Oldman succeeds in giving us a masterly character portrait with the necessary gravitas in Churchill's appearance, his tetchiness and simultaneous humanity, his gargantuan appetite and his vertical stability despite (or perhaps because of) large quantities of champagne, scotch and brandy and not least his humour, ranging from cutting wit to anarchic coarseness. Oldman internalises Churchill's speaking style, without mimicking him. 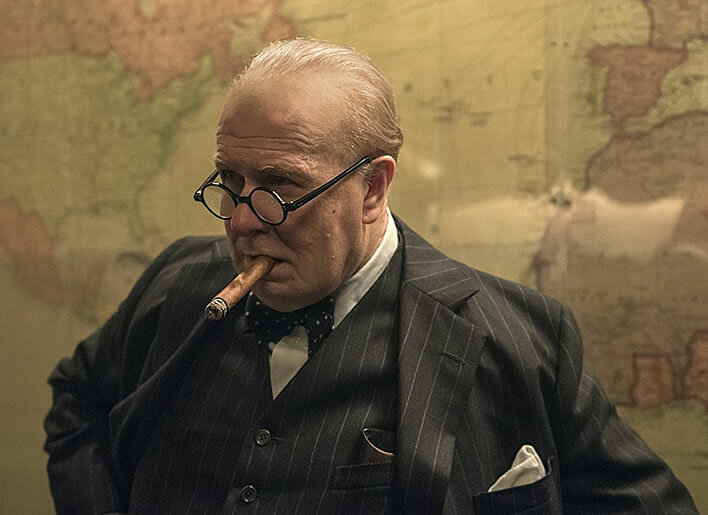 The latter would be impossible considering that Churchill's bass voice, tanned with whisky and Cuban cigars, was a good four tones below Oldman's pitch register. 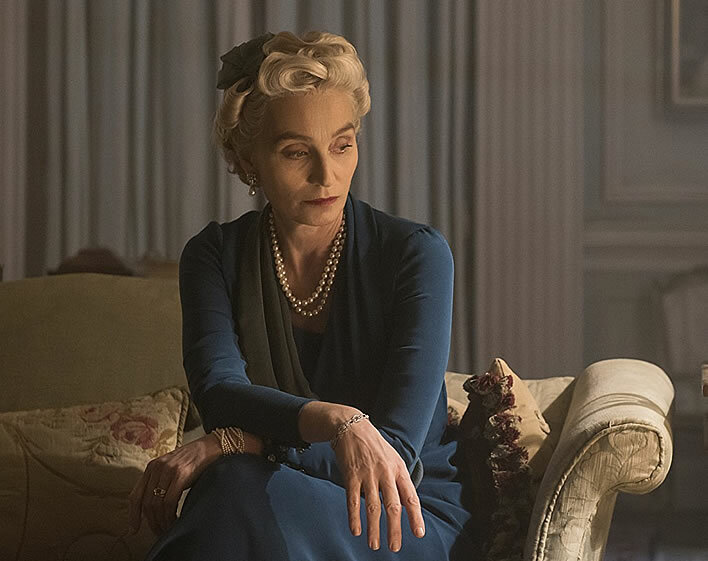 Top: Clementine Churchill (Kristin Scott Thomas). Middle: King George VI (Ben Mendelsohn). 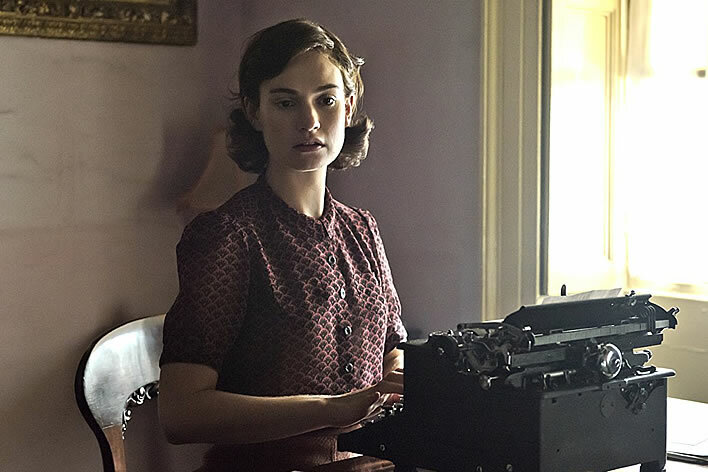 Bottom: Elizabeth Layton (Lily James). Images: photograph by Jack English, ©2017 Focus Features LLC. 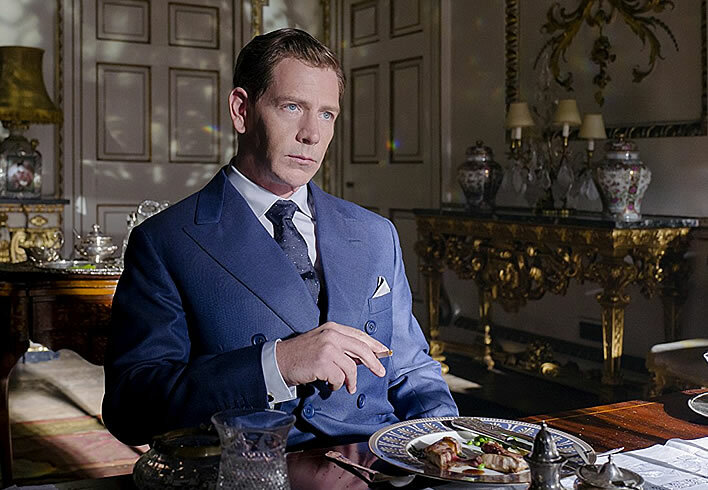 The roles of Clementine Churchill (Kristin Scott Thomas), King George VI (Ben Mendelsohn) and the young secretary Elizabeth Layton (Lily James) are excellent casting. With them in ensemble Oldman offers us a power quartet, in which 'Clemmie' and the King are quite on a par with him. Growing up in the sixties as a child of poor parents in southwest London, Oldman saw the scars that Hitler's Luftwaffe had bombed into the terraces of houses there. His mother always said to him that Churchill had been the saviour of England. And so he plays his Winston Churchill most impressively, as though he had his DNA. In Hollywood the rumour is that Gary Oldmann is the front runner for the Oscar for 'Best Actor' – he deserves it. This article was written by Dr. Werner Vogt. A shorter German version appeared in the Neue Zürcher Zeitung on 10 January 2018. This translation ©FoS 2018.